Boy, my posting in this thread is so sporadic, but it tends to come with pretty pictures, so bear with me. Now this one is about a problem many of us have had: Treekin models. Aren't they just ugly as all sin? Taking the Eternal Guard out of my army, I was left with a need for more the 'heavy' section of my army. And then it hit me, taking out the 15 Eternal Guard gave me enough points for 3 Treekin. It would have been a problem using Trees, because honestly I don't like the models. 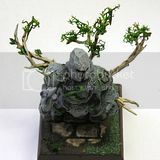 I'd considered using Kroot Hounds as bases, since I'm using a Krootox for a Treeman. But that didn't fit right. They weren't bridgewatchers. But of course, there's always room for conversions, and I felt like doing one. 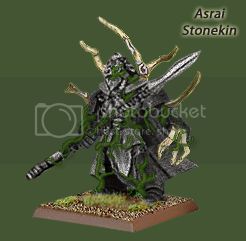 So instead of paying AU$28 per Treekin, I paid AU$65 for a squad of 5 Assault Terminators which would become my Stonekin. The following is just a photoshopped example but it should be good enough. I'll just put down the steps I plan to take. 1) Assemble the Terminator, filing off all imperial insignia. Base it on a square base. 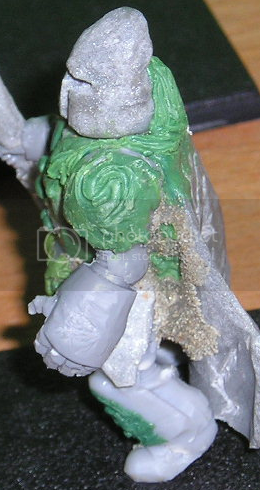 2) Use Greenstuff or other putty to fill in the gap where the head goes normally. 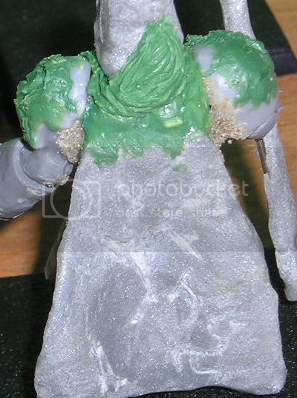 Then continue with the putty on the chest to detail something similar to an Eternal Guard chest. And the loincloth and pants region. Don't worry about the parts looking too Spacemarineish, it is a statue afterall. 3) The head is made entirely from Sculpey (Oven Bake Clay). 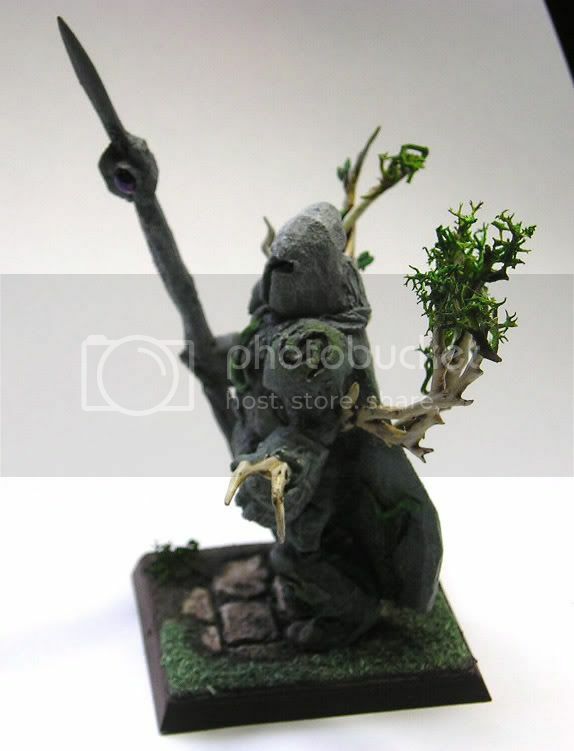 4) The cloak is Sculpey, since it's so big. No point wasting greenstuff. Oven-Bake Clay also doesn't change sizes once heated, so it's great for molds. The spear is a copper tube for the shaft with either a sword for the spearhead, or a plasticard tip. And it has greenstuff wrapped around to look like a grip. With the Assault Terminators, they also have Hammers, if you want to use them for variation. 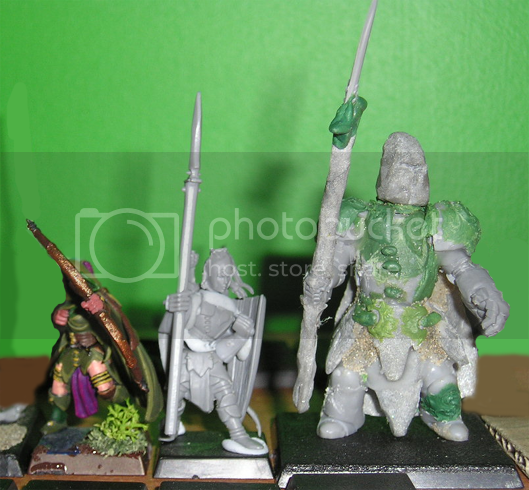 5) It's easy to paint, so just assemble it all. Then get a hobby knife (make sure it's sharp), and cut out little bits to look like cracks. 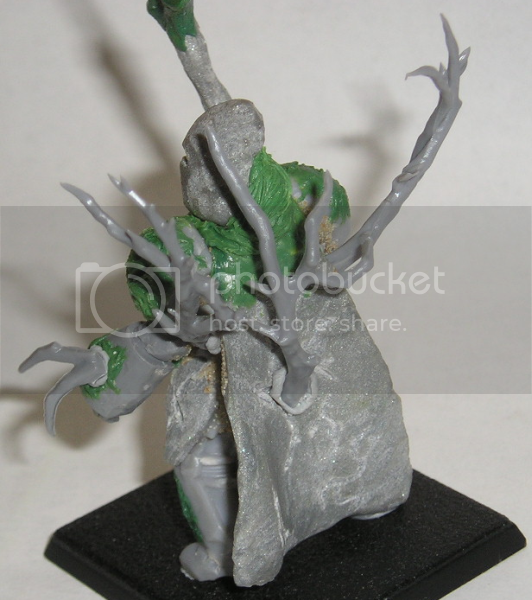 Pay particular attention to the back, as it needs the most covering up to obnubilate the vents and dodgy cloak. And this is where the actual tree will have burst from. So put in lots of jagged lightning cracks. Also, here you can chisel out runes. Just make swirls. 6) Spray the entire thing with Rough Coat. Then scrape it out of the places you don't want it (like in some cracks and in the faceplate, and where it obscures detail. Here also you can make runes, easier to do swirls, but they come out lighter. 7) From the back with all the cracks, glue in parts from the Dryad sprues to look like a tree growing from it. Then from the cracks you want to, greenstuff some vines growing out and snaking up. In the example, I've made the tree bits come from its back, one from each shoulderplate, and one like a dreadnought's claw from its hand. 8 ) Undercoat it all in black. I always undercoat in black for the details. 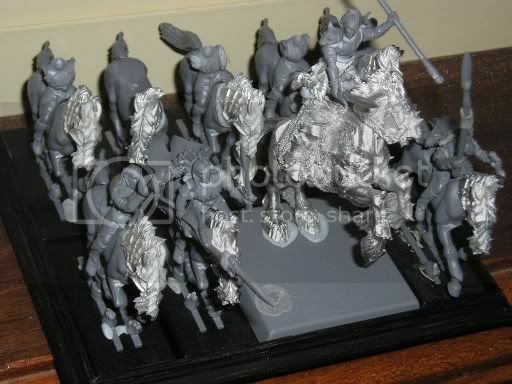 The entire thing is then drybrushed with progressively lighter shades of Black and Codex Grey. The Roughcoat is excellent for drybrushing. 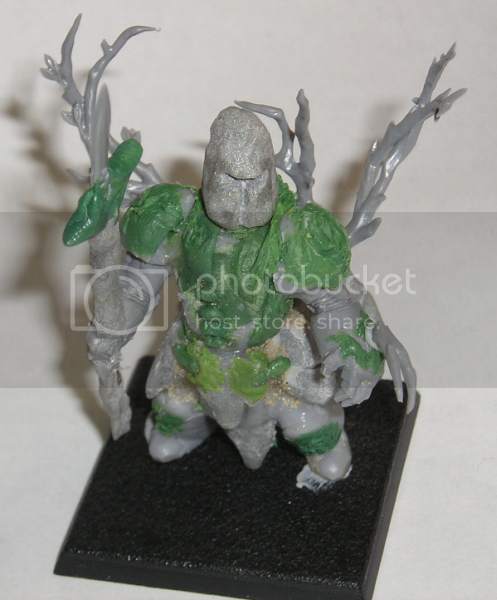 9) The vines are done in Dark Angels Green then in lighter shades up to Snot Green. 10) Then tree bits are done in browns, succesively lighter to Bleached Bone. And all runes for me will be painted in white. 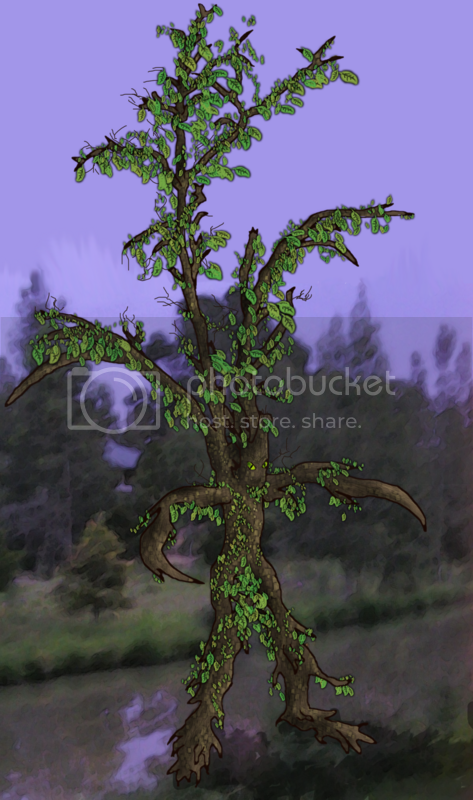 And a pretty picture of my planned Treant. Last edited by Foxtale on 05 Jan 2007, 04:17, edited 1 time in total. Dude, the stonekin's magnificent. It makes me think of a huge, barked-out eternal guard. 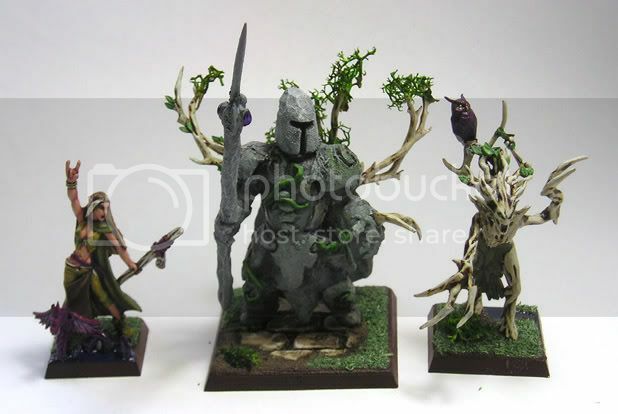 Stone Kin are well on their ways to being finished. Now I just need to find a way to get a spray of Rough Coat without buying the whole can! 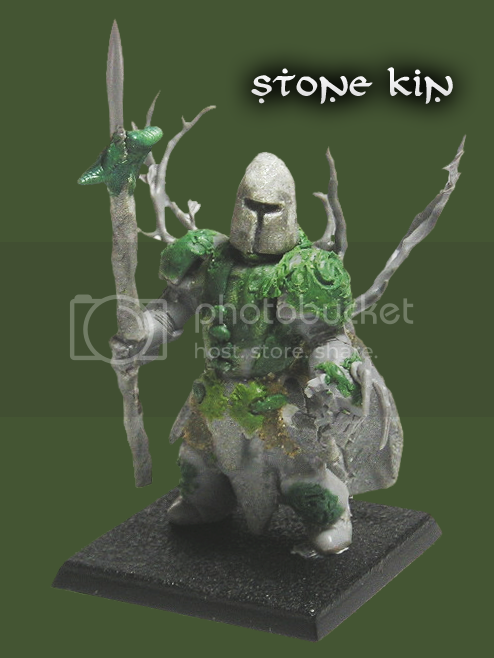 The stone kin looks really good so far, it does remind me of a big eternal guard (which is a good thing) . Just one thing is are you going to cover up the ribbed bits between the upper arm and lower arm armour on each arm? Oh and i really like the way you use bluetack to put your models together in concept, i might have to use that on the next unit i make . dont really like the spear on the stone kin, but otherwise very nice. loving all your conversions, especially the eternal guard! great work more pics please!!! Exploid wrote: Just one thing is are you going to cover up the ribbed bits between the upper arm and lower arm armour on each arm? No, no, hopefully the Rough Coat will do that. Highborn Sycath wrote: dont really like the spear on the stone kin, but otherwise very nice. Haha, I don't that much either, but since the hobby store close to where I live burned down (noooooooooooo!!!) I couldn't use copper tubing. 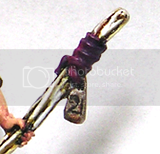 Though I am going to attach a gem to either side of the spear near the head. I can't decide whether to make the gems actual gems or whether to make them just carved into the stone. Any thoughts? And a random Eternal mockup, for the unit champion, proving that, yes, it is possible to make an eternal guard with shield on the bow arm. She looks great. But I have to admit that it kinda made me laugh. It looks like she's throwing up the international symbol of rocking out. You just need an Ozzy Osbourne clip to play whenever she successfully casts a spell. davidvc04 wrote: She looks great. But I have to admit that it kinda made me laugh. It looks like she's throwing up the international symbol of rocking out. You just need an Ozzy Osbourne clip to play whenever she successfully casts a spell. I'm moving all the trees to the sound of Crazy Train! Wow, the purple looks fantastic on that spellsinger . 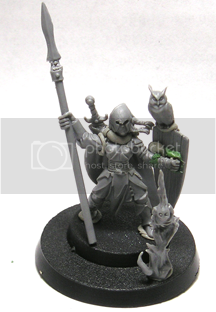 Also the eternal guard champion looks great, there's so much on him! 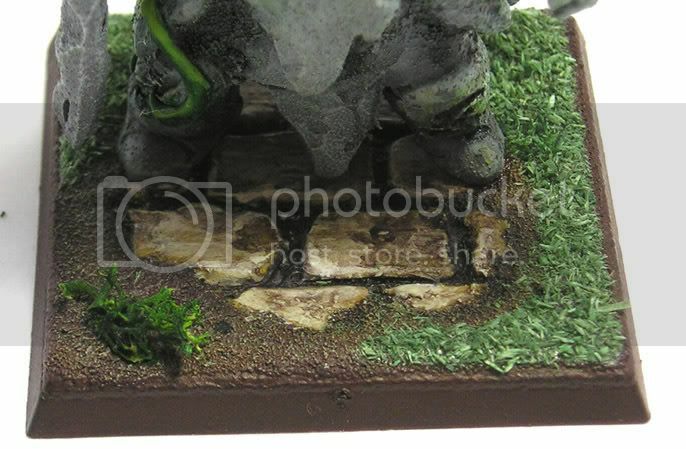 By the way, what's the theme behind those slimy looking things coming out of the spellsinger's base? Edit: it looks kind of like a water dragon/snake...is that what it is? and is it something to do with your armies fluff? Anyway, it looks cool . 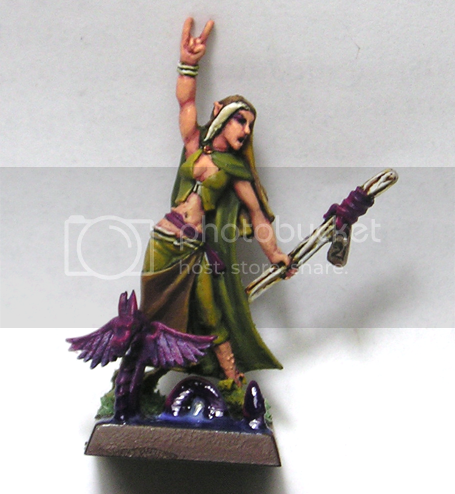 Great model, great paint job on the Spellsinger. I tried to track down that model myself, but was so upset when it was sold out! The Rogue hair is a nice touch, adds a little flavor and serves as a good highlight. Storm wrote: By the way, what's the theme behind those slimy looking things coming out of the spellsinger's base? spellsinger looks nice, but i prefer the metal eternal guard. Well whatever it is it looks nice . 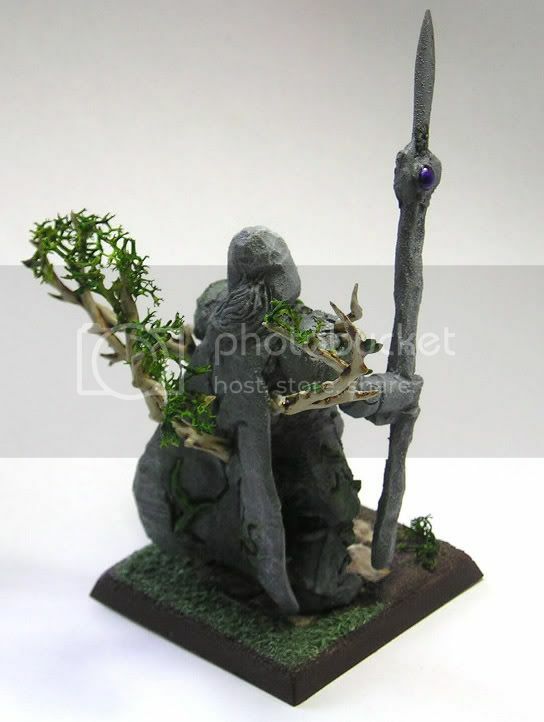 Here's my Stone Kin/Tree Kin model. 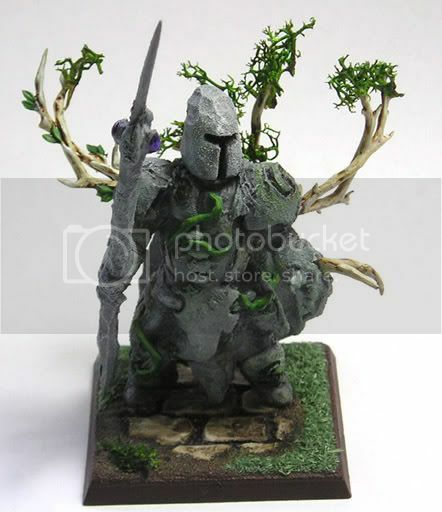 Converted from a Terminator, used to represent my Tree Kin in game. I didn't quite like the current Tree Kin models, but I love the stats of them. You can see the gray of my Tree Kin in my posts above. I would love to see a huge unit of those....10 or 15 of them!!! Not to sau that the one isn't cool enough!! Wow, Foxtale. That is very cool. At first I wasn't sure what I thought, but the picture of it next to the elf-sized models sold me. The Stonekin is a very cool concept that's very well-realized. An ingenious idea Foxtale. 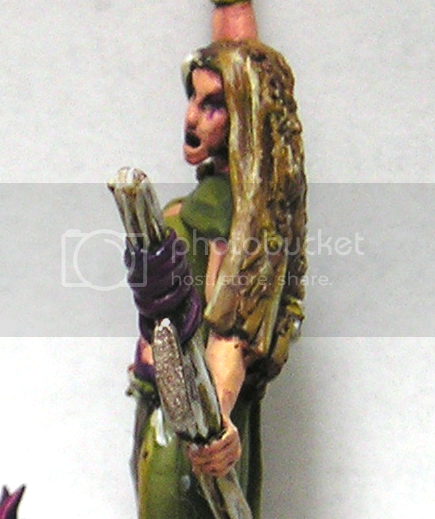 The model suits a woodelf army surprisingly well. I need all your help again. This one's a biggie for the converting gurus here. 1. 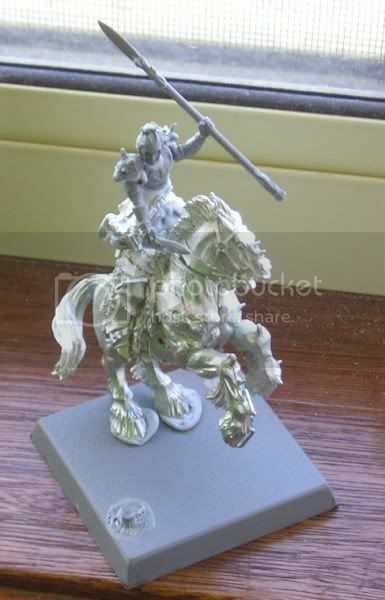 Unfortunately, the archaon horse model was cracked right down the side and would need a lot of patching up to fix. Dammit! 2. Archaon's legs are still attached and it is going to be horrible to remove them. 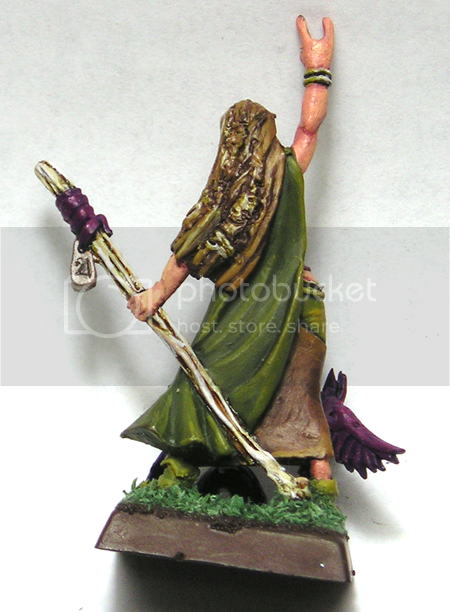 Also that I will need to flip the spear over so he's stabbing down. 3. The noble needs to be raised up like he is now, otherwise he looks too small. Unfortunately, it's those same legs of Archaon (pretty as they may be) that are holding him in this position. Removing the legs will drop the noble down, yet sculpting a saddle may look silly as he will be somehow sitting in the wrong position on it. A dilemma, and one I need your help on. My Noble on Great Stag. Grey, unpainted, blutacked. And in his unit to show how huge he is. gonna have to get those legs off, and see where it can go from there i guess, thats what i would do first anyways.